The Grey water system is designed to filter water from the kitchen, shower, washing machine, sinks and tubs. Why Include a Grey Water System? If you are using the Aquatron composting toilet system or the Farmstyle waterless compost toilet you still need a grey water system to deal with water from the kitchen, laundry, shower, bathtub and basins. Provides complete treatment of waste water before being disposed of safely. Fully self-contained system requires minimal maintenance. Made in New Zealand to the highest quality standards. The household grey water is drained or pumped to a settling tank where solids are settled out and floating scum retained. The grey water then flows into a pumice-filled filter tank before going to a soakage field. If secondary treatment of the wastewater is desired, the pumice-filled filter tank is left out and waste water flows from the settling tank to an AES soakage field, where the secondary treatment occurs. 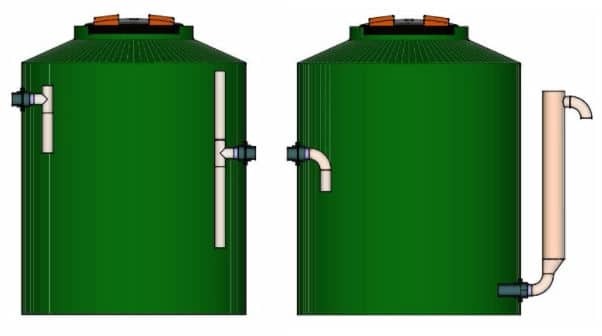 Rendering of the two tanks used for final waste water treatment (if only primary treatment is required).